Google is still trying to win a U.S. import ban (exclusion order) againt Microsoft's Xbox gaming console. It's unlikely to succeed because it faces a double (procedural and substantive) hurdle, but this process has been a bit of a roller-coaster ride. After spending $12.5 billion on an acquisition that was, at the time, described primarily as a patent purchase but has failed to give it any serious leverage against Apple and Microsoft, Google quite understandably wants to leave no stone unturned. Yesterday a notice of appeal filed by Google's Motorola Mobility with the United States Court of Appeals for the Federal Circuit on Wednesday became publicly accessible. The wholly-owned Google subsidiary is appealing the United States International Trade Commission's (USITC, or just ITC) May 24, 2013 decision not to review an Administrative Law Judge's (ALJ) March 22, 2013 remand determination clearing Microsoft's Xbox of infringement of U.S. Patent No. 6,069,896 on a "capability addressable network and method therefor" and, since this was the sole remaining patent in the investigation after Motorola's withdrawals of the other four patents-in-suit, denying an import ban against Microsoft's gaming console and certain accessories. 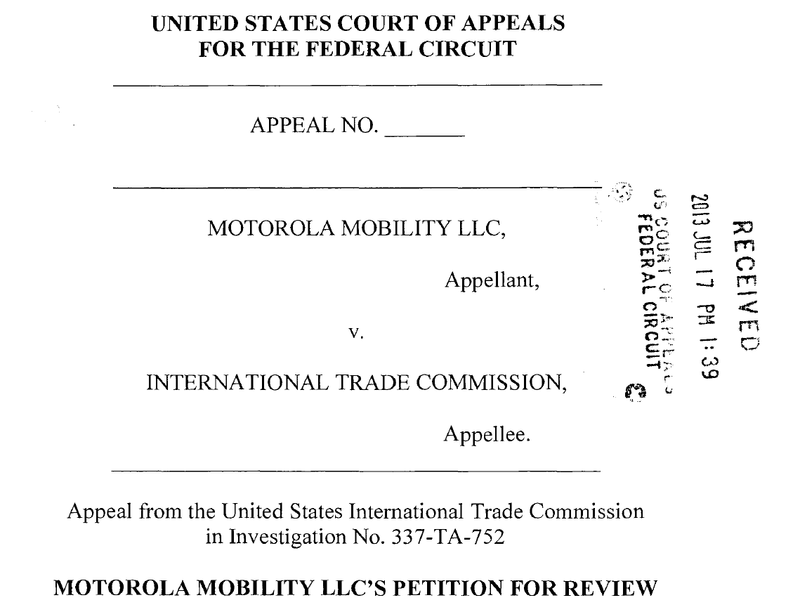 The appeal cannot and does not seek to revive the four patents Motorola had dropped along the way. 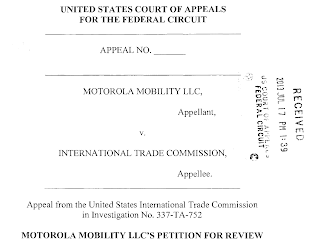 Motorola brought the original complaint in November 2010, in response to litigation Microsoft started in October 2010 after licensing talks failed. The five patents-in-suit involved four standard-essential patents (SEPs) and one non-SEP (which is the sole remaining patent in the case at this stage). On June 29, 2012, the Commission (the six-member decision-making body at the top of the U.S. trade agency) decided to remand the investigation to the ALJ, and provided instructions in its remand notice that made a dismissal of the complaint the most likely outcome. The Commission's guidance included a reference to the standard for indirect-infringement theories and contentions in an ITC proceeding as clarified in 2011 (about a year after Motorola's Xbox complaint) in the investigation of S3 Graphics' first ITC complaint against Apple. That clarification created a fundamental problem for several patents-in-suit, including the '896 patent (the sole remaining patent-in-suit at this stage). Due to the aforementioned double (procedural and substantive) hurdle, this appeal is a rather difficult one for Google to win. It needs to convince the Federal Circuit that it timely presented its indirect-infringement theories in a way that satisfied the requirements clarified in the S3G-Apple case and that those theories have merit, both of which was denied by the ALJ and, ultimately, the Commission. Microsoft was more successful against Motorola at the ITC. It won an import ban over one patent in May 2012. There's currently an enforcement dispute in which Microsoft is pursuing a preliminary injunction obligating U.S. Customs & Border Protection to enforce the exclusion order in accordance with applicable rules. The U.S. governmental agencies and officials who have to defend themselves in that action have been granted (by the United States District Court for the District of Columbia) an extension until August 2 to respond to the preliminary-injunction motion. And the breadth of the import ban could still change. Both parties appealed: Motorola wants to reverse the import ban (which is difficult since it conceded infringement) while Microsoft would like to prevail on additional patents. The Federal Circuit will hear this cross-appeal on August 6, 2013. In other Microsoft-Motorola news, a Google motion to exclude certain testimony from the late-August breach-of-FRAND-contract trial in Seattle has been successful in part. On Friday, Microsoft told the court that it reduces its "claim for recovery of legal fees, costs and expenses by $3,105,517". That amount corresponds to invoice entries that Microsoft's counsel had color-coded before a damages expert evaluated the documents. Previously, Google's Motorola had dropped one counterclaim and three affirmative defenses challenged by a Microsoft motion for partial summary judgment (while preserving most of this for an appeal). Both parties have now helped to narrow the issues Judge Robart will have to rule on at the end of the month in two hearings relating to dispositive motions and that the jury will have to consider at next month's trial.